A senior staff member for New York Attorney General Eric Schneiderman used a private email account five years ago to set up meetings on climate change with prominent environmental groups. Legal discoveries show that Lem Srolovic, the assistant attorney general at the New York Attorney General’s Office, used his personal email account in 2012 to prepare for a meeting with various environmental organizations. His email raises questions about how often Schneiderman’s office uses personal emails for professional meetings, which would be a violation of New York law if done while gathering information for the AG’s Exxon probe. Srolovic used his personal Gmail account in November of 2012 to send PowerPoint presentations to his colleagues in the AG’s office in preparation for a meeting with “environmental organizations.” It is not clear from the email if the presentation was meant to build a case against fossil fuel companies like Exxon, but there is evidence the campaign against the oil company began as early as 2012 at the La Jolla conference. 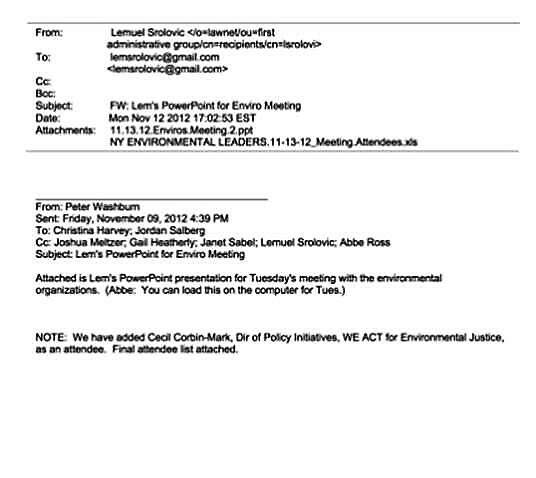 The only attendee mentioned in Srolovic’s memo was Cecil-Corbin Mark, the director of policy initiatives for Economic Justice, a group that later held an audience with the AG two years ago to talk about climate change. Schneiderman met with Economic Justice’s Karla Sanchez, a deputy attorney general in the NY AG office, as well as environmental activists associated with billionaire Tom Steyer in 2015, according to an email log obtained last year through public information requests. The get-togethers coincided with the New York Democrat’s year-long investigation into Exxon’s climate research. He kick-started the crusade against the oil company in November 2016, “demanding extensive financial records, emails and other documents” from Exxon dating all the way back to the 1970s. Several other attorneys general, including fellow Democratic Massachusetts Attorney General Maura Healey, have leaped on board the inquisition since that time. Schneiderman’s initial probes ushered in a slew of inquiries from other AGs, most of which were based on reports by liberal-leaning media outlets InsideClimate News and Columbia University, which claim Exxon has known the risks of global warming for decades but kept such knowledge under wraps. The bulk of his colleagues has since dropped their pursuits. The media have applauded InsideClimate News in the past despite the fact the outlet’s chief benefactor, the billionaire Rockefeller Family Fund (RFF), colluded with several environmentalist groups to take the oil company. Schneiderman, meanwhile, continues to stonewall attempts to obtain emails between his office and wealthy donors such as Rockefeller Brothers Fund, RFF, and Steyer. He uses a Freedom of Information Law (FOIL) “law enforcement” exemption to justify blocking the requests, and claims his communication with the donors is part of the Exxon investigation. His unwillingness to fork over emails has roiled at least one of his predecessors and raised suspicions Schneiderman’s goal is politically-motivated. Schneiderman has even managed to pull in $264,000 in campaign donations from well-heeled people with ties to lawyers and environmentalists backing the Democratic prosecutor’s global warming investigation. Billionaire financier George Soros and his family have even chimed in to help fund New York’s main law enforcer. Soros’ family has shoveled $251,000 into Schneiderman’s political war chest since 2006. Soros himself has given the New York attorney general $64,500, while his sons and daughter-in-law donated the rest. News of Srolovic’s email usage comes at an inopportune moment for Schneiderman, who disclosed earlier in March that current U.S. Secretary of State Rex Tillerson used the alias “Wayne Tracker” for years when he served as the Exxon’s CEO. The Democrat made his revelation while hiding the names of donors behind a nearly two-year investigation into Exxon’s climate research. The company’s legal representatives accused the Empire State lawman of manufacturing an email scandal involving Tillerson to provide a rationale for his investigation, according to court documents filed Thursday in New York.